Are you ready to do some fabric and pattern shopping?? I’ve found a bunch of great sales for you! Happy shopping! Go To Designs – 75% off your order over $60. Use code WOW75 at checkout. Blank Slate Patterns – 2 children’s PDF patterns for $10 with code THANKS2016 or two women’s PDF patterns for $15 with code GIVING2016. Peek-a-Boo Pattern Shop – Biggest sale of the year – see site for details. I Heart Tula Pink – New “Quilt with Tula and Angela” signed books now in stock! Deer and Doe – 20% off all sewing patterns through Saturday. No code required. Serendipity Studio – 20% off all patterns and booklets; 10% off all KW Made items. Itch to Stitch – 30% off all patterns using coupon code black. Valid through Monday. Love Notions – 15% off all single patterns Friday through Monday with code thanks2016. Closet Case Files – 20% off patterns using coupon code THANKSGIVER. Good through Sunday. Alina Design Co. – 25% off of all patterns (bundles excluded) and the code is GIVETHANKS16. Art School Dropout – 40% off patterns from Friday until Monday at midnight EST and 25% off all accessories. Jaybird Quilts – We’re selling Jaybird Quilts tshirts on Small Business Saturday! Hunter’s Design Studio – use thankful25 for 25% off all patterns through Cyber-Monday. Swoodson Says – Fun, modern patterns with creative twists that are perfect for gift giving. Use ‘BlackFriday2016′ for 50% off, Friday 11/25 at 8 AM CST – Tuesday 11/29 at 8 AM CST! Emkie Designs – Use the Code BLACKFRIDAYPR for 20% off all patterns and pattern bundles. Valid November 25-28. Blue Calla Patterns – Coupon code is BlackFriday2016 for 35% off all patterns. Blue Nickel Studios – Friday12AM PAC Time – Monday 12PM PAC time for 30% off all patterns SMALLBIZ16 is the code. Oliver+S/Liesl+Co./Straight Stitch Society – 40% off the retail price of patterns through 11/25 at midnight. Use coupon code HOLIDAY2016 at checkout for your discount to be applied. Emmaline Bags – November 25th only, use coupon code Bling2016 for 35% of all copper and bag hardware. Sew Over It – 30% off all kits and patterns using coupon code BLACKFRIDAY. Alison Glass – Take 15% off your order using coupon code THANKFUL16. Good through 11/28. Thread Theory – all pdf patterns are 50% off. Grainline Studio – Enter the code GIVETHANKS16 at checkout for 20% off your purchase. Good through November 28th. Sew-Ichigo – all paper patterns are marked down 40%. Chris W. Designs – 30% off all patterns using coupon code “cyber16”. Valid through to Monday. Imagine Gnats – 25% off the whole shop except gift certs friday-monday. Use coupon code 25off. Westwood Acres Fabric – 20% off ALL of our In Stock, Hand Cut Bundles using the code GRATEFUL Gotham Quilts – Friday, November 25th. Tula Pink Coloring Books are $9.99, Cotton + Steel Coloring Books are $9.99, 5-piece Tula Pink or Cotton + Steel Mystery FQ Bundles are $9.99, and Tula Pink’s City Sampler Book is $19.99. Plus free shipping on US orders over $80! Villa Rosa Designs – All Free Spirit fabrics 7.97/yard! Excludes Kaffe but everything else is game! We’re also adding 100’s of bolts to our clearance! Starting at 4.97/yard. All orders over $75 are free shipping!! Stone Mountain and Daughter Fabrics – 25% off using coupon code shopsmall25, good 11/25-11/27. Sew Modern – Online 11/24-11/28 with code GOBBLE. 20% off all fabric yardage including Sale! Craftsy (affiliate link) – Deals on classes and supplies. Stash Fabrics – 20% your entire purchase with code THANKFUL4U from 11/23-11/28 excluding gift certificates and preorders. Also receive a FREE $5 gift certificate for each $50 spent on gift certificates in the shop during through Cyber Monday. No coupon required for the gift certificate promotion – the additional gift certificate will come with the other gift certificates and will be valid for a full year starting in 2017. The Intrepid Thread – 20% – 70% off everything in the shop including 50% off all Patterns, Books, and Notions. Pink Castle Fabrics – 30% off all Bundles with code BUNDLE30 on Black Friday! 30% off everything (except Janome) Small Business Saturday – Cyber Monday with code CYBER30 Girl Charlee – Sale from Wednesday – Sunday with new items added every day, 30 – 75% off! Southern Fabric – Spend $1.00-$25.00 – receive 10% OFF; Spend $25.01-$75 – receive 20% OFF; Spend $75.01-$125 – receive 25% OFF; Spend $125.01+ – receive 30% OFF. No coupon needed. Nido – All quilting cottons are $8.95 (excludes organics and batiks). The Quilted Castle – Take an additional 30% off any Sale or Clearance item. Includes sale kits, sale precuts, sale patterns. Use code thanks30 at checkout. 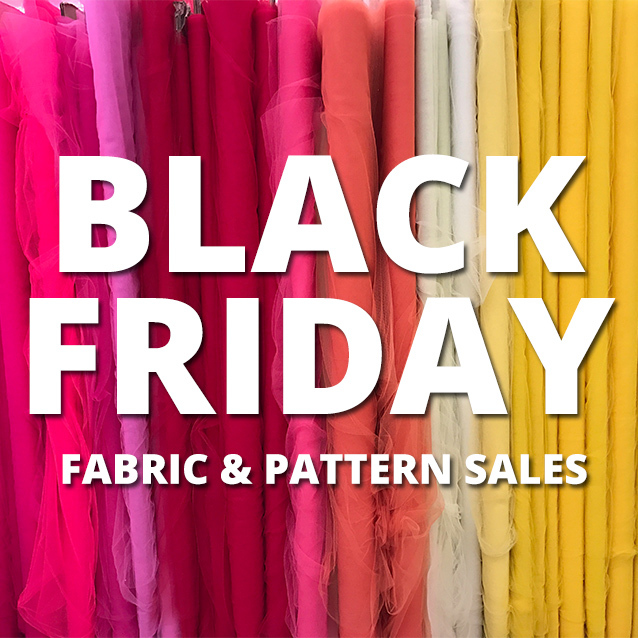 *Offer good through 11/29/16 Pile O’Fabric – 45% of all printed fabrics, 20% off Kona Cotton, 20% off Skill Builder Block of the Month Classes, and 20% off wash-away stabilizer. Lady Belle Fabric – Up to 40% off bundles, 30% off pre-cuts, 25% off quilt kits and a free mini quilt pattern with orders over $50. Sale ends Cyber Monday, no codes needed. Fat Quarter Shop – 20% off site wide, plus free items with every purchase. Good through Saturday. Spoonflower – 10% off sitewide, now through Monday. Stitch Supply Co. – 20% off your order using coupon code THANKS20. Good through 11/28. Crimson Tate – 25-50% off bundles – no code needed. ilovefabric – 30% off your order using coupon code THANKFUL16. Good through Saturday. Threadbare Fabrics – 25% off all fabrics using coupon code THANKS2016. Good through 11/28. « Printable Christmas Bunting, Cards, Tags, Parties and More! Here the homepage which provides online free animal jam codes online without downloading any file or something completely free of cost.